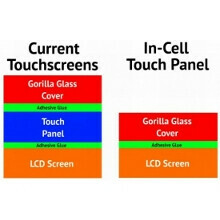 In-cell touch panels are a great thing - they allow for thinner devices and improve backlight penetration for brighter displays, that's why Apple is going with them for the iPhone 5. If you can make enough of those, that is. After TPK losing its touch panel orders from Apple because of its inability to produce an in-cell panel with the required quality and quantity, now the blessed Japan Display (joint-venture of Sony, Hitachi and Toshiba), LG Display and Sharp, are having troubles with the new technology. They were only estimated to produce 4-5 million in-cell displays in July, while Apple has booked 20-25 million for the third quarter, in order to fill the initial iPhone 5 demand. The issues are not with the technology per se, but rather with producing enough yield to warrant the expensive manufacturing process. Japan Display is supposedly the one with the highest yield rates, and they barely touch the 50% mark, supply chain sources say. LGD, which initially was said to be improving its rates to 70-80%, is now allegedly unable to scale those into mass production, while Sharp hasn't even budged from the very low yield it managed to achieve in the first place. Apple has reportedly put Sharp under probation, and will evaluate its production methods and results from scratch, while it is said to subsidize each panel from the others with $10-$15 to make it worth their while. These subsidies are, of course, peanuts for Apple, compared to what it will make on each iPhone 5 handset sold, but they will still raise production costs a bit. Couple that with the more expensive manufacturing each gadget with a brand new design would entail for Apple, compared to previous models at the end of their cycle, and the margin on the next iPhone might very well be slightly less than usual. Tim Cook used to be responsible for the production, since he became the CEO he obviously was losing control of that department. Apple may have to slip the iPhone 5 release date if it can't build up a large enough stockpile of inventory. Anyone for an October, 2012 release date? maybe,they could also release an initial batch and then create those usual apple 'waiting lists' until the 'sold out' handset come back into stock circulation. Every year this situation happens,its an apple ploy to drum up iPhone rabbies fever!! Eh. I applaud Samsung for growing a pair an standing up to the technology tyrant Apple. Samsung put the foot down and started making great phones. Now they sell more smartphones than Apple. Plus it was probably smart for them to break ties on making Apple's displays, Samsung needs more production for its own phones. Maybe if they paid these people more than pennies to produce this $h*t for their phones they would produce them faster. Apple makes ridiculous margins on their products while simulaneously screwing over the workers that assemble their products and make the components for them. That's what happens when you f*ck with Samsung. Better start picking up those bread crumbs. I wonder how durable these panels are. Will they survive being dropped? This issue, coupled with poor yield (not even 50% for the most efficient supplier?!? ), and the move apple has made towards parts glued together versus screwed together..... Well, let's just say they could be bit by this on the backside as well (warranty repairs). I smell haters and jealousy. SG3 having a ton of quality issues I should know I work with the warranty department. To this date wp7 phones are the best quality with less issues just need wp8 to bring a better update and I think Microsoft will be the winner in the end. Why so many displays, oh that's right they are all ready taking IPhone 5S into consideration.